Would Facebook or Twitter ban President Trump? Would Facebook or Twitter Ever Ban President Trump? One says it wouldn’t, and one says it would. 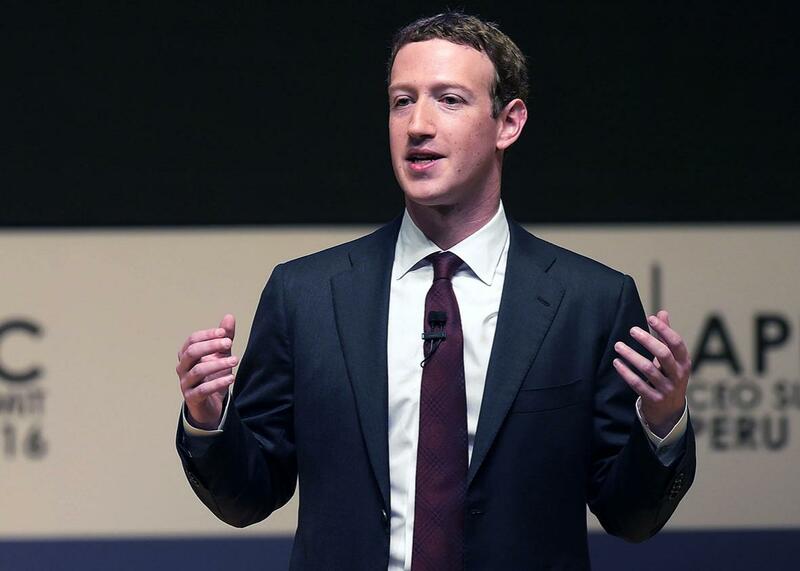 Facebook CEO Mark Zuckerberg speaks during a session of the APEC CEO Summit in Lima, Peru, on Nov. 19. Could the president of the United States ever get suspended or banned from a major social network? The answer: It depends on the network. It’s a hypothetical question, of course—but not merely an academic one, given the president-elect’s track record of using social media to sow conspiracy theories, attack reporters, threaten political rivals, and call for religious discrimination. Facebook and Twitter in particular have already struggled to reconcile their policies on harassment and hate speech with some of the activities of Donald Trump and his political allies. And the two social networks have offered starkly different answers to the question. Facebook has indicated that it will not apply its normal community standards to posts from President-elect Trump, given their newsworthiness and the widespread popular support for his views. But Twitter told Slate that no one is exempt from its rules—not even the president. Facebook, meanwhile, has adopted a more permissive stance toward Trump and other public figures, led by CEO Mark Zuckerberg. “When we review reports of content that may violate our policies, we take context into consideration,” a Facebook spokesperson said via email. “That context can include the value of political discourse.” The spokesperson noted that this approach is not Trump-specific. Still, the Wall Street Journal reported in October that some Facebook employees had pressed for Trump’s Facebook page to be suspended for posts that they believed violated the company’s community standards on hate speech, including posts that called for a ban on Muslims entering the United States. But Zuckerberg decided in December that it would be inappropriate to interfere with a major-party candidate’s political posts, the Wall Street Journal reported. Our real goal is to reflect what our community wants. That kind of content, we would have thought previously that would make a lot of people feel uncomfortable, and people wouldn’t want that. But at the point where the person who’s elected president of the United States is expressing that opinion and has 60 million people who are followers, then the question is, OK, I think that that is mainstream political discourse that I think we need to be pretty careful about saying that that’s not a reasonable [inaudible]. This marks something of a role reversal for a pair of social networks that have historically taken fundamentally different stances on inflammatory speech. While Twitter earned a reputation as a platform where almost anything goes, Facebook has long sought to maintain a family-friendly atmosphere by removing posts and suspending accounts that appear to violate its relatively strict policies. Both companies have adjusted their philosophies in recent months in response to mounting criticism. Facebook reversed its decision to block the Pulitzer Prize–winning “napalm girl” photo in September after a backlash. The company said it has begun to take into account posts’ newsworthiness in such decisions, in recognition of Facebook’s increasingly influential role in the distribution of news and political speech. Twitter, meanwhile, has been adding new tools for users to report, block, or mute harassers and trolls. The company also said this month that it has broadened its interpretation of hate speech and retrained its employees to enforce it more consistently and aggressively. That doesn’t mean Twitter is likely to ever delete a Trump tweet, let alone suspend his account. That he has avoided its censure so far suggests it would take something outlandish even by Trump’s standards for Twitter to take action. (For reference, the New York Times in October compiled a list of everyone Trump has insulted on Twitter since declaring his candidacy.) By the same token, it’s conceivable that Facebook could decide at some point that it is possible for the president of the United States to cross a line after all. Practically speaking, the sort of post that would get Trump suspended from Twitter may not be so different from the sort that would provoke a reaction from Facebook. Still, it’s telling that the two social networks have staked out opposite positions on this question so far. In Twitter’s case, it reinforces the company’s recent tough talk on harassment while bolstering its claim to be a democratizing platform, where the lowly and the powerful are subject to the same rules. The risk, for Twitter, is that it might actually be called upon to back up that tough talk. In Facebook’s case, the preferential treatment for Trump is indicative of the company’s pragmatic approach to enforcing its own rules, as well as its burgeoning appreciation of its role in politics and the media. But it also further undermines the company’s claim to be a neutral platform. Ever since it felt the wrath of conservatives this summer, Facebook has been at pains to present itself as politically evenhanded. But the idea of evenhandedness itself presumes equivalence between the views and actions of different political parties and figures—a presumption that Trump’s presidency will sorely test.